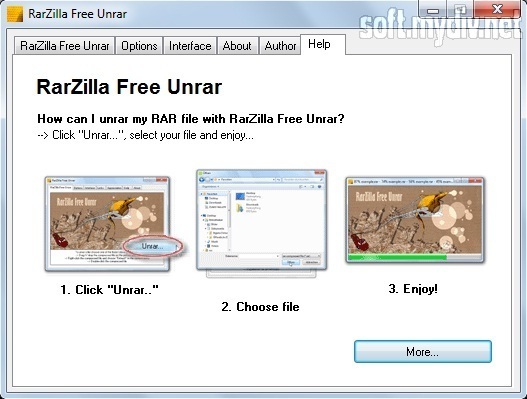 RarZilla Free Unrar is a decompression utility which could help you to extract archive files. After installing the program will integrate into your context menu. So, you can decompress files using right-click button of the mouse. Also, it supports drag-and-drop if you want to extract files quickly. Although, it hasn’t additional functions, it’s a really convenient tool for extraction and decompression. Just remember that it works only with RAR extension. The utility has a simple interface that is displayed in a small window. There are only six tabs. 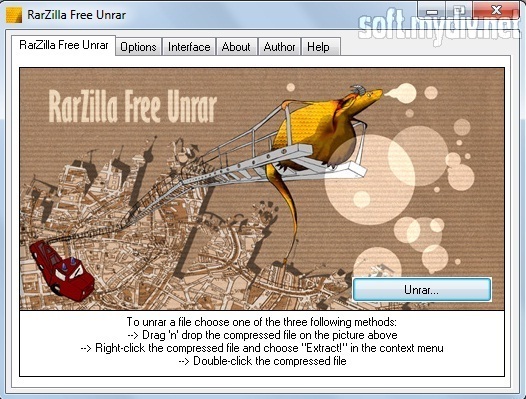 To extract files, you should push on Unrar button which is on the first screen. Then you have to choose your archive in the explorer. After that, you can select the folder where RAR files will be allocated. There are only two radio buttons: Extract files to the same folder or Extract files to the default output folder. The last option provides Browse button to choose your directory for unraring. Click on the OK button to unpack files and view them using the explorer. If you want to change a language, you should open Interface tab. There you’ll find all options for customization. About tab allows you to update the program. There is also donation button. Help tab is the tutorial guide. If you want to open archives which are encrypted by a password, you should open Option tab and load password list. You can also use default password (the first form). The utility allows you to extract RAR archives. You can use default password or pass list to open encrypted files.